This publication introduces the Pharmacists’ Patient Care Process, which was adopted in May 2014 by the Joint Commission of Pharmacy Practitioners (JCPP), a group of 11 national pharmacy organizations. The goal is to help pharmacists understand the components of the standard patient care process and apply the process to patients in all pharmacy practice settings. Six sample case studies set in different patient care settings enable the reader to practice applying the patient care process. 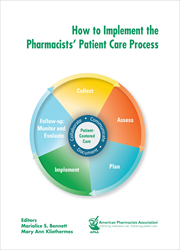 Additional activities enable pharmacists to evaluate existing patient care services, develop strategies for continuous quality improvement, and create an implementation plan for their practice.